A quaint local Italian restaurant with signature dishes, thick zesty marinara sauces, and lively entertainment on weekends by a local swingtime band. A popular locals restaurant. Yes, there are new owners. The same people that own Fibbers on the Water in Little River which is a top ten Myrtle Beach waterfront restaurant three years in a row! Everything at Cozy O's will stay the same when it reopens on Thursday, September 26st. Great news, great restaurants! We know the owner and when we were there in April we were told he was selling the business. Is this now under new management? If so, there will never be a Cozy O's the way it was. The owner was super friendly and the food out of this world. I have eaten at Cozy-O's for the past two years. Each and every time I eat there, the food is wonderful, plentiful, and absolutely delicious!!! I have had the grouper special, veal marsala, pork-chop marsala, and the cozy o combination. Both are to die for! Best food ever. BUT if you are a wine drinker- beware! Their so called WINE list is terrible. The house wine-Taylor- is undrinkable. They need to have more of a variety or an upper end chose of wine by the glass. To me, wine and Italian food go hand and hand. If you read these reviews, please, please-start offering a good quality Chardonnay and Cabernet. Then you will have the most ultimately perfect restaurant in every way! Great Food and great portions for your money, brings back the olds days with music and fun. I love the eggplant dishes and Shrimp Alferdo! 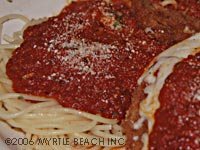 My favorite Italian Restaurant in Myrtle Beach!! I was fortunate to have dinner at Cozy O's on Saturday March 24,2011 with a few friends. They had been several times before and always talked about how wonderful the food was. The meal was delicious beginning with the appitizers, salad, main course and after dinner drink. The atmosphere is very friendly and the service was wonderful. The owner takes the time to speak with everyone which makes you feel very special. It also has great music and will play by request. It was a wonderful night! Thanks Wayne for helping the Fayetteville girls enjoy their night! I am sure it won't be long before we will be back again. First time visiting after this restaurant was highly recommended by friends. Really enjoyed the atmosphere and the live music. The owner was extremely cordial and came to our table during our meal and thanked us for coming and asked us to please come back when we were leaving. The only downside to our experience was the service. Our waitress was quick to seat us and take a drink order but slow to return to take our dinner order. From watching other tables being served I am sure we should have received our bread and oil with our salad which would have been more enjoyable. She apologized several times and thanked us for our patience which made us feel somewhat awkward but we just endured. Our food was delicious but we were not asked if we wanted dessert and we had to ask for our check. We will be back but will not sit with same waitress. After hearing a lot about how great this restaurant is from friends we decided to go during the Labor Day weekend. We went with friends and all four of us went in with very high expectations. All of which were met and exceeded. The food was the best Italian food I have ever had! I hope my Italian Grandmother doesn't see this! The lasagna was the best! Kenny was our waiter and did a great job. The owner Wayne stopped by our table and talked with us making sure we were being taken care of and in talking to us it was like we had known him our entire life. He then had to leave to play drums with the small band in the back of the restaurant. All in all a great evening. Thanks Wayne! My date and I went to Cozy O's to have dinner on a Tuesday night around 6:00pm. The atmosphere is so unique, quaint and very pleasant. We met at the Bar for a few drinks, Christy, our Bartender was very nice and fixed a great Brandy! We ate dinner, I had the grilled grouper, stuffed with crabmeat and a delicous salad. My date had the Sausage Pasta and salad. The bread, our waiter, and of course Wayne was very friendly! Great service and excellent food!!! I even bought one of the table oil lamps as a memorabilia of this wonderful evening! George and Debbie Thanks! Went last night with two other couples (all of us are from the NYC Metro area) and had a great dinner and a great time. We drove about an hour from Murrells Inlet and were not disappointed by anything. From the moment you walk in you know you're in a great neighborhood cafe. Diane took our orders with a lot of laughs and started the evening off just right. Wayne the owner greeted us and visited with us after the meal - VERY friendly and a lot of fun, too! The food was great from the bread and garlic oil and salad straight through the wonderful main dishes (we all had something different and everyone loved their meal) to the great cannoli afterword. We all agreed the trip was worth the time and we will be back again. Had the lasagna. Did not care for the marinara sauce. Was bland and almost tasted burned. Another diner at table said it left an aftertaste. Another who was Italian did not like it at all. Wayne (owner) was great. Felt right at home. Food was of "home made" quality. Portion size was a bit small (if you are going to charge a $6 split plate fee... ya better "put it on" to make a customer feel they are getting their moneys worth). Band was nice... a Jazz trio that played the whole time we were there... with most appropriate dB level that allowed for conversation. Lots of repeat customers and staff was awesome and very accommodating. Outside entrance is deceptive, but once you are inside you will feel as if transported to Little Italy, NY. I live near here. This is my all time favorite Italian Restaurant anywhere. The atmosphere is like home for me - the staff is fabulous and caring - and the prices are reasonable. We visited this resturant twice during 2009 and once during 2008. All 3 times we were seated immediately and had prompt, efficient, and friendly service. During 1 visit in 2009 the piano/drum combo was playing and on the other, the Dixieland Jazz group; both were excellent and provided a very enjoyable atmosphere along with the subdued lighting. The Italian style food was exellent, served hot, in very sufficient portions, and the desserts were also delicious. This place would be easy to overlook since it is in a stip mall, but it is well worth the effort to seek it out. The quality for the money is well above average. We were seated immediately on a Friday night by a very personable host. Our waitress, Kim was very friendly and after telling us the specials also gave us her written list because there were so many choices. My husband had the pork marsala and I had the chicken piccata; both were delicious. There was a combo (piano & drums) playing old standards - - very enjoyable and professionally preformed. We had dessert and coffee and Kim kept the coffee coming so we could stay and enjoy another set from the combo. We will definitely return; we felt the food and entertainment made this a good value for the money. The atmosphere is cozy just as the name indicates and the staff including the owner are anxious to see the customer is treated well. This resturant could be overlooked due to its location in a strip mall, but you will be pleased if you try it. After our first night at Cozy O's, things were never the same. We came expecting good, turned out to be great. In addition to the seafood and pasta dishes, we would highly recommend the pork chops to all lovers of the other white meat. The service is first rate as is the music. If we're not there at least twice a month, we must be out of town. My husband & I visited cozy o's for the first time last week and had a wonderful dining experience. Not only is the food fantastic (i had the chicken saltinboca - which I highly recommend), but so is the staff. Owner wayne stopped by our table to meet us and ensure that we were having a good time. He is extremely personable, and the fact that he makes an effort to meet his guests leaves an excellent impression. Kelly, who waited on us, is very charming, enthusiastic, and an overall sweetheart. Everyone - even the other guests - made us feel like we were part of a big family. Put together great food, friendly staff, and welcoming atmosphere and you've got a winning combination. We will definitely return!. Absolutely wonderful! Between Wayne, Kelly - who waited on us - and the food which was fantastic, we could not be more pleased. You can tell the other people in this establishment are having a good time as well. We visited for the first time a while back and have since been back and are just as pleased. Obvious as to why it is a local favorite. I had a simple dish of homemade meatballs and raviolis, and it was delicious. My son had the chicken/eggplant parm and loved it. My grandson, 18 months, enjoyed the calamari. We all did. It was so fresh, not chewy. The owners could not have been more gracious. We were there on a Thursday nite, and the band was fabulous. Talented musicians, wonderful food, and great ambiance.. We will go back..
My husband found the add and liked the way the name sounds, Cozy O"s Cafe. He had grouper with crab, I had sausage peppers and onions. Excellent choice for Italian food,and priced very reasonable, Owner Wayne was very attentive, to every patron and their needs, and our waitness Colleen as well. The dixie land band was relaxing and enjoyable to say the least. We will be back. Cozy O's is definitely cozy. Not too big with a nice atmosphere. Owners Wayne and Rosemary are wonderful people and usually at least one of them are at the restaurant, if not both. The grouper is to die for and Rosemary's sauces are like grandma used to make. My husband is Italian and cooks himself, but raves about Cozy O's. Prices are reasonable, especially for the portions you get - we usually bring something home. Have not been disappointed yet and we try to go at least twice a month. Bon appetite! Cozy O's is an excellent restaurant. The place really is "cozy". I loved it soooo much when i go back to S.C i will be going to Cozy O's. GREAT food! Try the chicken and Murphy saugage...if you can take the hot peppers! This is the place to eat regardless if you are a local or a visitor. THE FOOD IS PHENOMENAL. The service is quality and the restaurant is rated one of the CLEANEST in the area. Oh yes, and the entertainment makes it FUN! Everybody has a great time here! Authentic New Orleans-style Dixieland on Thurday night...Excellent food and atmosphere. Everything is great about this place. It is a wonderful cozy atmosphere. I will be going back very soon, when i visit South Carolina. We stopped in on a Thursday evening and enjoyed a great bonus to our delicious meal -- a jazz group was playing with the regular piano player! These guys were great! And we're told they play every Thursday evening.. Great food AND great music in a local's favorite restaurant. We'll be back! This is a great little Cozy home feeling bar and restaurant. They have an excellent piano player on Friday and Saturday nights. Its great to sit around and listen to great music and eat wonderful food. Cozy is the right word for this newer restaurant next to Food Lion in Little River. Great food, and some nights there is a piano player that's really good! We go here often.